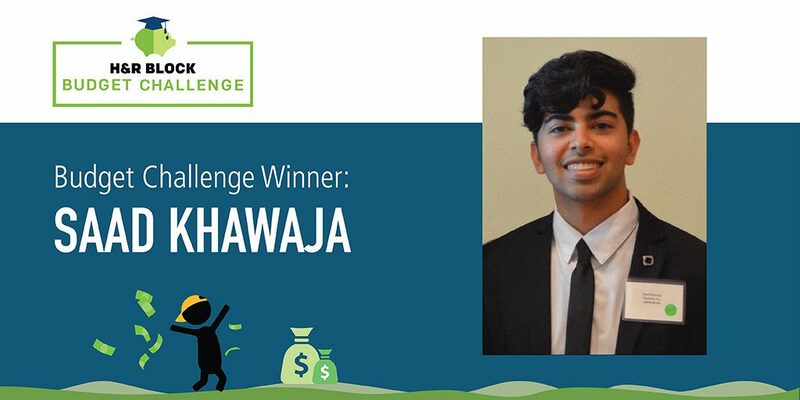 When Texas high school senior Saad Khawaja isn’t shooting hoops with his friends or participating in DECA, you can find him checking how stocks are doing on the stock market. How’s that for “average teenage behavior”? You said you like to invest in stocks. Where did that interest come from? Ever since I learned about the concept of money, I’ve had an interest in how to invest money and make more of it. I don’t think that interest came from a class or my parents—I just learned it on my own. I haven’t invested with my own money yet, but I plan on doing that soon. Do you ever talk about money with your parents? Occasionally we do, but I think financial knowledge came to me more through the news, current events and seeing how the economy works. My parents and I talk about college tuition, which will be important for next year, but we also talk about certain expenses and income tax. Obviously, I haven’t started saving for retirement yet, but we talk about my future 401(k). Were you excited to take the Budget Challenge? I heard last year another student from Clements High School, Angela Lin, won a scholarship and first place overall. I was really inspired by her winning that scholarship, and I wanted to win just as much. That was amazing for me because I thought I wasn’t going to win. I told myself I’d play and just try my best and see what happens—and it happened. What’s the most important lesson you learned in the simulation? I think I’ve learned quite a bit from the Budget Challenge, but I think my biggest takeaway is the work ethic you need to really mange your money. You can’t just go out in the real world and do something without a plan. You have to be able to account for all your expenses. You need to have a plan to achieve your financial goals. How did you find out you won? Then I refreshed the page and saw that I was still number one, so it started to set in. I waited for the confirmation email to come before I told my parents because I wanted to be sure. Initially, I didn’t even tell them I was competing so they were so happy. Does winning a scholarship change your college plans? It really has. It costs a lot of money to go to college, and the scholarship has allowed me to go to a school that I possibly wouldn’t have been able to go to without the scholarship. I’m leaning toward the University of Houston or University of Texas. Before winning the scholarship, I was planning on going to a community college, but the scholarship has really helped me money-wise. Now, I might not have go to community college for the first one or two years. I plan on studying finance, but I’m also interested in the hospitality industry, like restaurant and food service management. It’s been a tough choice for me, but I think I’m leaning more toward finance. Do you think teaching teens money management should be required in high schools across the nation? I really think it should be mandatory because, first of all, students might find out they’re interested in money and decide to major in it in college. These classes helped me decide my interest. It’s also really necessary for people to understand how money works. Most people don’t realize that when they go into the real world they can’t do simple financial tasks. I know from my experience, even when I didn’t know much about money, I wanted to. Most teens feel confident they can manage money, but when it comes to the real world, it’s harder for them to keep track of their money. And that’s what the Budget Challenge taught me—keep track of all your money coming in and balance it. So really, I think teens think they know how to manage money, but it’s a lot harder to do in reality. Learning financial literacy is fun with the H&R Block Budget Challenge. Learn more about the Budget Challenge and how H&R Block is helping prepare teens for the real world at HRBDS.org. *Responses have been edited for clarity.